During the 1990s, the SWATCH and Siemens Wave Tours rocked the world from Europe to Asia and back to California, as the world’s best skateboarders, skimboarders, surfers, snowboarders and sailboarders competed on the mobile FlowBarrel® Bruticus Maximus, to see which sport was dominant. Now that the Bruticus Maximus has a permanent home at Wave House San Diego, it is the final platform for the Wave Loch FLOW Tour – a series of flowboarding competitions that begin in the spring and travel to a dozen locations around the United States. The Wave Loch FLOW Tour has divisions for bodyboarders and flowboarders, men and women, boys and girls, amateur and professional. For at least ten years, the Tour has inspired an ever-expanding level of competition among bodyboarders and flowboarders around the United States – and it all comes to a head on the Wave Loch FLOW Tour. In addition to the Summer FLOW Tour, there are local events at Wave Houses and waterparks around the country and the world. Every spring, the ALT Games comes to Wave House to let the world’s best collegiate flowboarders compete for their National Championship. 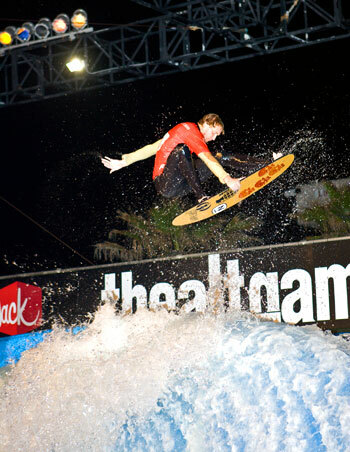 And through the summer, Wave House San Diego hosts the Flow Jam, a series of five events from April to July, with qualifiers in 2009 traveling to Singapore to compete at Wave House Sentosa in the inaugural World Championships. Flowboarding is a combination of equipment, techniques and styles borrowed from surfing, skateboarding, skimboarding, snowboarding and wakeboarding. No one discipline is dominant. One year, the best guys are snowboarders, and then the next year, a skimboarder will show up and blow minds and be “king of the thrill.” With new Wave House facilities opening around the world, innovative athletes are being brought into the sport every day, and the evolution of this 21st Century hybrid sport continues forging ahead at higher, deeper and more radical levels. © Copyright 2018 Wave House Holdings, LLC. The Future of Nature, Wave The Planet, Wave Loch, Wave House, and the World Wave logos are trademarks of Lightwave, Ltd., with other US and international trademarks pending. Other trademarks used under License. U.S. patents 5,664,910, 5,860,766, 5,911,190, 6,460,201, 8,561,221 with other U.S. and international patents pending.